Do you live in Cedar Key? 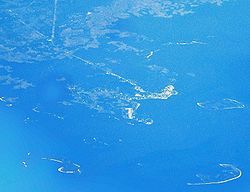 Aerial view of Cedar Key and its outlying islands, illustrating the extremely small size of the city. The fork at State Roads 24 and 347 (the only two access roads) can be seen in the upper left.